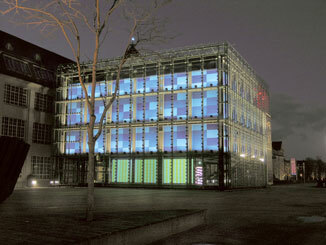 From 26 November 04 by 6 March 05 the Center for Art and Media ZKM Karlsruhe became as institutional interface between art and science a place of appearance for the „100 Days - 100 Imachinations“. For the director Peter Weibel the ZKM with its museums and research institutes is an institution of basic research in images. In exhibitions like Iconoclash or the Algorithmic Revolution various concepts around images were discussed. Pas de deux in the Subroom with Paik's "Internet Dream"
The back projection of 3 by 12 meters in the subroom of the ZKM cube in direct neighbourhood to Paik‘s „Internetdream“ was large but nevertheless ephemer. 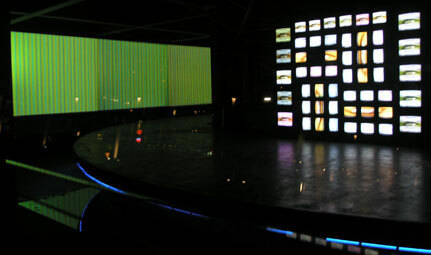 Around the clock the daily changing picture series was projected by three projectors. Disappearing nearly completely in the bright of the day, the impression of a hardly definable mediality and materiality of the Imachinations was reinforced by the spectators movement around the glass cube in the dark. Parallel to the discussion on the „diagrammatic turn“ at Schloß Dagstuhl the presentation at the ZKM was used to make an approach towards the notion of imachination as complicated interaction of man and machine. Images are today increasingly the product of an elevated division of labour. The image processing chain is less hierarchical thereby, but rather aligned to an interdisciplinary co-operation. With regards to the disappearance of the difference man-machine therefore Peter Sloterdijk introduced the figure of the agent in his spherical approach. The change from a static to a performative notion of image mentioned Eva Schürmann. Controversially Barbara Könches and Beat Wyss discussed, how the art behaves to the imachinative competences in the sciences. Ludger Brümmer and Woody Vasulka talked about artistic approaches in working with code. Read more about those positions in the Imachination Report III or just read the whole interviews in the reactive zone.